Looking for some local family fun? To celebrate the upcoming release of the new movie Cloudy With a Chance of Meatballs 2, "foodimobiles" will be visiting family-friendly destinations across America. Just in time for lunch, the menu will be full of options including Tacodiles (Tacos), Subwhales (Sandwiches), Hippotatomus (Baked Potatoes), Barry Strawberries, among many others. The food will be served in lunch boxes featuring characters from the film, and visitors will also get recipe cards explaining how to make foodimals at home. Pretty cool! 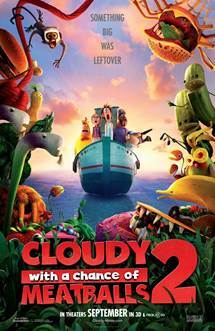 Philadelphia, PA - Saturday, September 14 at 12:00pm, the CLOUDY WITH A CHANCE OF MEATBALLS 2 Foodimobile Truck will be stopping by the Please Touch Museum at 4231 Avenue of the Republic.